Has the Economy Hit a Wall? Again? HomeBusinessHas the Economy Hit a Wall? Again? The market re-priced some significant asset classes last week. There was not that much news behind the big adjustments. So I’m left wondering. To be sure there has been a growing whiff of a slowdown brewing for a few weeks. The announced end of QE2 has come at a very inconvenient time. Tightening monetary policy in Europe (or the threat of it) is part of the change in sentiment. Then there is the slowdown in China. We have also come to learn that Japan, (contrary to all the initial bullish spin) is not going to be anyone’s engine for growth. And finally, we end the week with what appears to be a very significant step forward to a restructuring of Greek debt. Has the economy hit a wall? Again? For me, this is reminiscent of last summer. That was also a period where there was evidence of a slowdown. 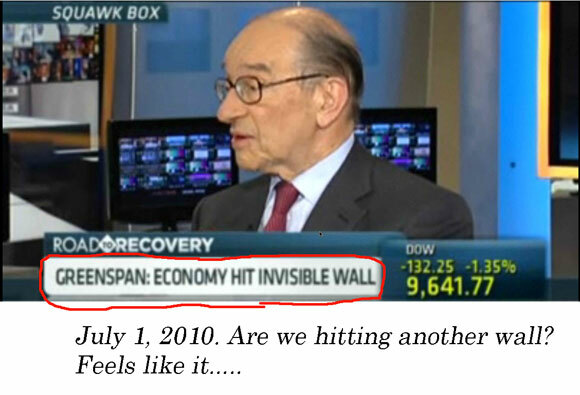 Greenspan scared the hell out of everyone with his comment, “The economy has hit an invisible wall”. I’m convinced that the Greenspan comment was the final push Bernanke needed for him to commit to QE2. It took him another two months of talking with the other Fed heads, but on 8/27/2010 he gave the infamous famous speech in Jackson Hole that he was going to expand the Fed balance sheet with more QE. 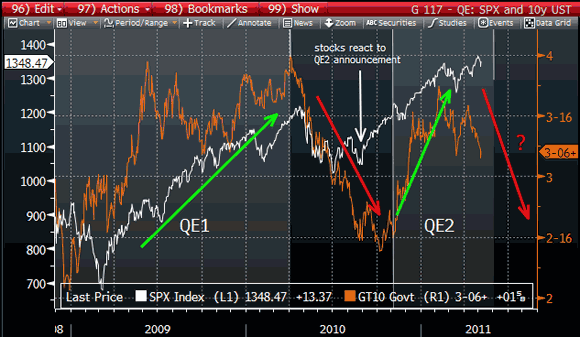 A friend sent me this chart that looks at the equity market and the history of QE. The pattern is pretty clear. When QE is first announced stocks catch a bid and bonds trade lower. When QE is ending the opposite has happened. Stocks work lower and so do longer-term interest rates. The market conclusion is that without a constant dose of QE the economy (AKA the Stock Market) will sputter. Maybe the market is right this time. I’m not so sure how reliable the market “view” is this Saturday given how wrong it was last Saturday. One thing I am convinced of; there will not be a QE3 in 2011. Not even Bernanke can flip flop that fast. Having just announced the end of QE2, there is no way the Fed is going to sneak in a QE3 over the next seven months. That’s not going to happen. If the existence of a QE program is the necessary condition for growth in the USA we are in very big trouble. We are looking at two dead ends. One is an economy that can’t grow, create jobs and pay for the $10b a day we are spending. The other is a monetary policy that will most certainly kill the country in just a few years. 1 Comment on Has the Economy Hit a Wall? Again?